The best polygon reduction technology is now available as an efficient, easy to use and highly affordable tool. Atangeo Balancer features high quality, high fidelity mesh simplification (aka polygon reduction or mesh decimation). It accurately preserves the model visual appearance, features, normals, texture coordinates, materials and layer boundaries. 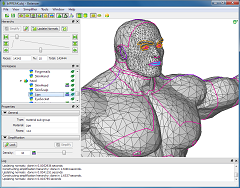 Quickly and easily find your perfect balance between visual appearance and the number of polygons. 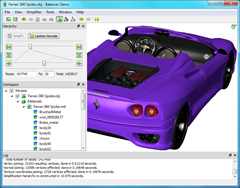 Instantly pick an optimized model with required face count or use accurate tolerance-based simplification to obtain desired visual quality just in one click. Balancer is extremely fast and efficient. Very small memory footprint and high speed performance allow Balancer to quickly and easily simplify models with millions of faces. In addition to the main version, Balancer has these two variations. is a free version. It is fully functional but works with small meshes only. The limit for a single mesh is 15000 triangles. If your entire model is large but has many small independent meshes or layers, you can still use Balancer Lite. Before loading your model, enable Balancer to split the model into independent meshes in Tools | Options | Importers | Wavefront .obj.